The Linksys RE6400 AC1200 Boost EX Wi-Fi Range Extender is a range extender from Linksys with 802.11ac technology. It has a plug-in format factor that allows the product to be plugged into a power outlet. The Linksys RE6400 can easily increase the range of a Wi-Fi network with two non-detachable external antennas that provide Wi-Fi range extension. 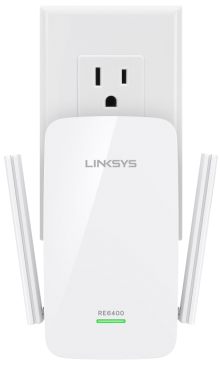 The Linksys RE6400 also offers the option to use it as a wired range extender (Access Point mode) or a wireless range extender (Range Extender mode). Power / WPS Light – This displays the status of the Linksys RE6400 based on the light's behavior (OFF, blinking, or solid) and color. Wi-Fi Protected Setup™ (WPS) button – Use the WPS technology to automatically and securely add wireless devices to your network. Reset button – Press and hold for 10 seconds to reset the range extender to factory defaults. 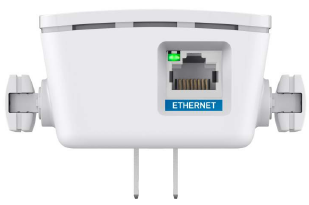 ETHERNET port – This port is used to connect wired clients such as computers or media servers when the Linksys RE6400 is in Range Extender mode or connect to a router when it is in Access Point mode. Weak connection with the router. Not connected to the router or other error. Unplug and reconnect the range extender. Make sure your router has an internet connection and Wi-Fi is turned on. If the router is in order, unplug the extender, move it closer to the router, plug it back in, wait one minute, and reconnect to your network. An ethernet device is connected and active. The light blinks when the extender is sending or receiving data over the ethernet port. Boost Wi-Fi range up to 7,500 sq. ft.
Click here to know more about the Linksys RE6400.